Just for the record, this project wasn't started recently. I simply cannot knit that fast. I wish I could, but I sadly I can't. I had actually started it back in March during the drive back to the island from the Okanagan. I had mentioned this project in this post and in this post before I had a chance to properly blog about it. Then I promptly forgot to even blog about it at all. I'm not using stash yarn so this project doesn't qualify in my quest for 12 in 2011. Instead I'm using yarn that I had (impulsed) purchased in February and was too impatient to not start knitting with it. So what am I knitting? 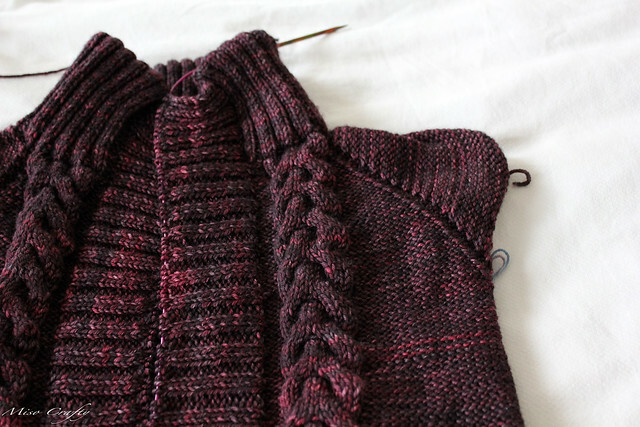 The Hooray Cardigan by Veera Välimäki and I'm using the luscious Tosh DK by Madelinetosh. At first I wasn't sure about the colour (for those with inquiring minds, it's Oxblood), I thought it was too dark and that the cables would get lost, but the more I knit the more I decided that I truly did like the colour and that the cables actually popped. Maybe it's the reverse stockinette? Who knows? I for one though, am really loving the marriage between the pattern and the yarn/colour. 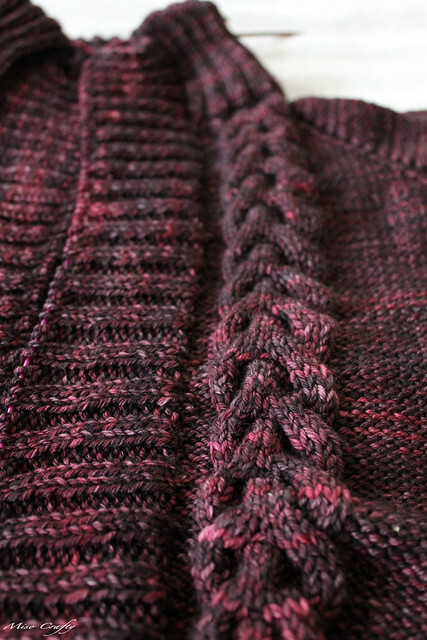 I had stopped all knitting on this project at the end of March, when I had mis-crossed cables (again!!) on the front AND the upper back. I dreaded the idea of ripping or tinking back to fix those mistakes and was dead against the idea of embroidering the new cable on, a la Yarn Harlot in this post. Instead, I isolated the areas and dropped those stitches all the way down to the boo-boo'd cables. If I thought it would help the knitting, I would've had a shot of whiskey before diving in but since whiskey would have made me make more mistakes I opted for the quiet alone time that I had when Brett took the Munchkin to his play group. I can't wait to see what you do with your skeins of MadTosh in this colourway!! When are you going to start knitting that up?? I wish you didn't live so far away! Well, to me you live far away. I hope I get to see more of you before the winter holidays commences!!! You just made my day my Love!